According to their function, the ladder must provide vertical linkages, which is to conduct a bottom-up and top-down from one point to another. 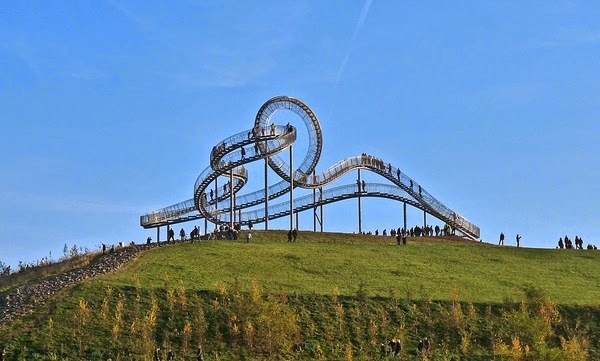 But all this does not concern the unusual staircase Crouching Tiger and Turtle, Magic Mountain , which appeared recently in the German city of Duisburg. 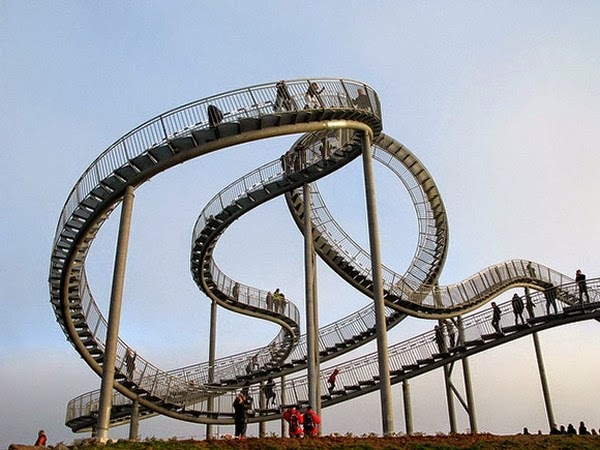 unusual stairs design picking up people at a certain height to those enjoyed opened their natural beauty. That staircase Crouching Tiger and Turtle, Magic Mountain (lurk Tiger and Turtle, Magic Mountain) in Duyburge carries similar functional load. 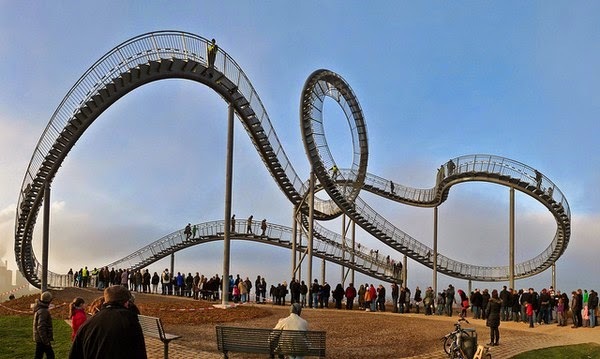 Actually, looking at this stairs design from afar, is not entered in any course of business man decides that before it the most common roller coaster - an attraction for lovers tickle your nerves, for people with good vestibular apparatus. But it will be wrong, because in Crouching Tiger and Turtle, Magic Mountain do not drive at high speed wagons - a ladder! Instead trailers on it move people. They go from step to step, rising and falling, rising and falling. No thrills! Except that, if someone is afraid of heights. 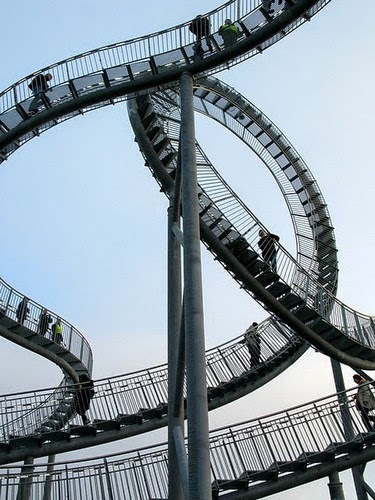 After all, from the top of this unusual staircase, located at a height of 11 meters, offers a great view of the German city of Duisburg, one of the largest cities in the Ruhr area. That's unusual lookout Crouching Tiger and Turtle, Magic Mountain, in essence. The authors of this extraordinary construction steel Ulrich Gent (Ulrich Genth) and Heike Mutter (Heike Mutter). As the main metal of which were created by design Crouching Tiger and Turtle, Magic Mountain, became zinc. 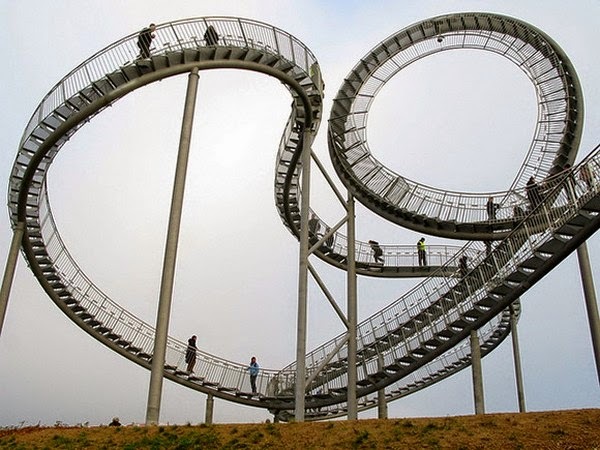 After all, on the site of the former mining zinc installed this unusual staircase, more like a roller coaster.